I was with my family in our farmhouse in Logar on May 2nd when the rain was thundering down like an ocean falling from the sky. Then on the 12 o’clock news I heard about the landslide in Argo, Badakhshan burying nearly 1,000 houses and 2,500 people. Only one person was found and all the others lost. The Afghanistan government was sending help. When we came back to Kabul, all day it poured and rain flooded the streets. I worried that school would be cancelled the next day, and wondered what was happening in Badakhshan that night. At sunrise I woke up early and the birds were singing, but mud was everywhere. As I made my way to school there were no smiles on people’s faces. It was like the entire city was dead and people had lost part of themselves. At my school I could see the pain for our broken nation in every girl’s heart. One of my schoolmates shouted to the sky, “Please let us live! Rain, do you have a heart? You are worse then Taliban.” At assembly we prayed for the people of Badakhshan. Everyone was crying. But then on my way home I heard about how some boys were gathering donations to send to the people of Argo. I met a student named Gul Balouch who was 19 and comes from a poor family in Sari-Pul Province in the north. He was standing with his friends and saying we must help Argo. I asked him some questions and he said he started collecting donations and soon they will take the money they raised to Argo. He said some people gave 500 Afghanis and others gave 10 Afghanis, but they didn’t lose hope and kept asking for donations. I felt better hearing this. He said the boys who worked as shoe polishers and car washers in the streets were helping. He said these boys with their earnings from a day’s work can get a shelter to sleep in, but in Argo the people don’t even have that much. He said the boys had collected 500,000 Afghanis and some clothes and shoes and soon they would go to Argo to help the people. The energy of these young boys was amazing. They were ready to give everything to save a life and it made me proud that we have such youngsters in our homeland. I knew then that we are all one people. We are Afghans. We are one in our pain and in our happiness. The author notes that interested readers can get information about helping at the Badakhshan Needs You website in Kabul. 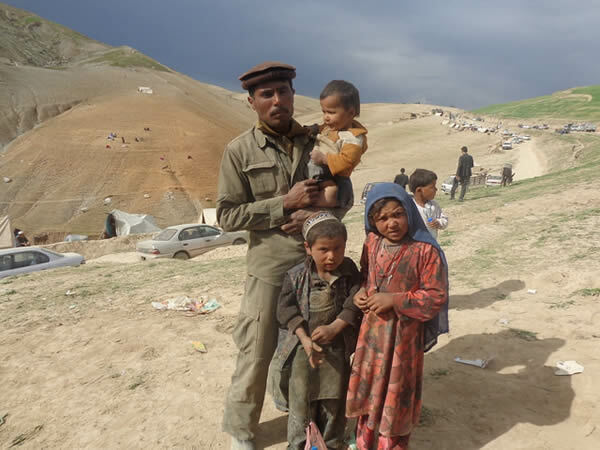 Photo: Mohammad Azim says he and his three children were lucky to survive as they were grazing cattle on a neighboring hill. But he lost his wife, parents, and a son who had stayed at home. Photo by Norwegian Refugee Council. Thank you for writing this, Aysha. It is so moving and so compelling ~ and so hope-giving! ‌Beautiful piece Aysha jan. This incident was very painful to all people. God bless the victims and give patience to their familes. I am so sorry for the loss in Argo, Aysha. Thank you for writing about the country’s reaction, the boys’ help, and your feelings. Stay strong.